GLOUCESTER CITY N.J. --The Gloucester City Police Department released the following statement regarding missing person Robert "Bobby" Dornbach, a local resident who went missing 11 years ago. "On November 27, 2005, Robert "Bobby" Dornbach left his home at 217 Cumberland Street in Gloucester City, New Jersey and has not been seen since. He was reported missing on November 28, 2005. If anyone has any information concerning this ongoing investigation, please contact city detectives at (856) 456-7797. Any information provided will be held in strict confidence. 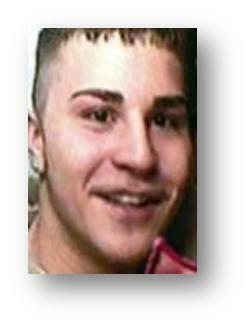 To my loving son Bobby, who has been missing since November 27, 2005, Happy 20thbirthday. "I can't believe you have been gone for three years. It feels like a lifetime. You were still my baby at seventeen with your whole life ahead of you. Since then, I wake up with a lump in my throat and go to bed with emptiness in my heart. I miss your kisses and how you told me that you loved me every night before bed. How I long to hear your voice again. I don't know what happened the day you left the house. I believe you went to meet someone and foul play caused your disappearance. I wish that I could be lighting 20 candles on your cake and singing happy birthday, but I'm still left searching the woods and water. I will never give up my search for you. I know you have not vanished from the face of this Earth. I wish someone who knows where and who you were supposed to meet would come forward and tell the truth, so the hell your family is going through would come to an end and you would be found and brought home where you belong. I will never forget the sound of your very first cry on the day you were born, September 15, 1988. It brought tears to my eyes then, and the thought of it always will. I love you, Bobby! This much;from here around the world and back, xoxoxo."